Color Me Fun is a mashup of rainbow-cheetah-pink-leopard awesomeness! 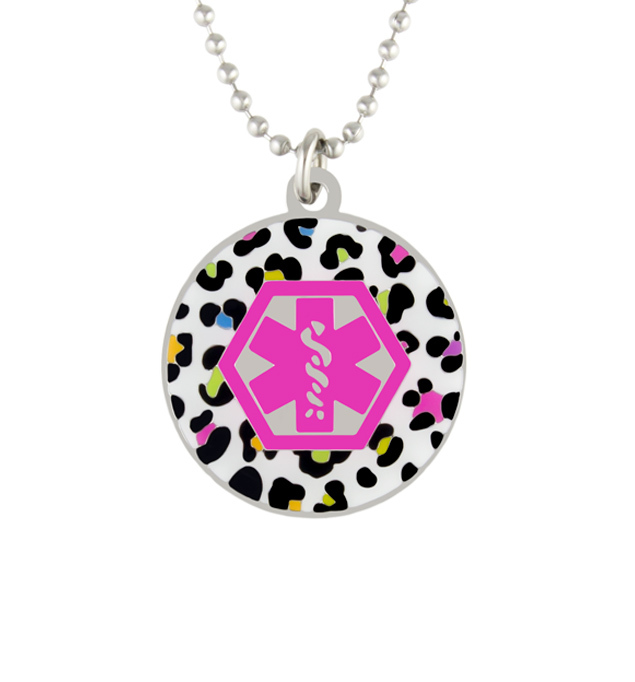 A Lauren’s Hope original, this on-trend, stylish girls’ medical ID necklace features a bright pink medical caduceus symbol that alerts first responders to your child’s information, engraved on the back. As with all stainless steel Lauren’s Hope medical IDs, both the pendant and necklace chain are nickel-free stainless steel for comfortable, safe, water-resistant wear. The Color Me Fun Medical Alert is a durable kids’ medical alert necklace you’ll only find at Lauren’s Hope. Whether the child in your life wears medical IDs for for Type 1 Diabetes, epilepsy, heart conditions, food allergies (such as peanut, tree nut, soy, or wheat allergies) or for any other medical condition or treatment consideration, medical ID necklaces are an excellent option. Easy to wear and comfortable under or over a shirt, medical ID pendants and dog tags are a great choice for growing kids.